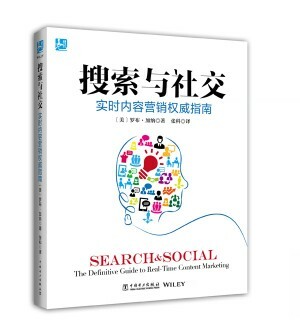 We’re excited to announce the release of Chinese market translation of “Search and Social: The Definitive Guide to Real-Time Content Marketing” by Rob Garner, Chief Strategy Officer at Advice Interactive Group. Due to the success of the book in English markets, this essential guide to modern Internet marketing will make its debut throughout China in late May 2014. “Search and Social” was published in 2013 and has since been lauded by many leading marketers and academics as one of the top publications in SEO, content and social marketing spaces. The intersection of these three sectors drives our thought process at Advice Interactive Group, where no one portion can fully succeed without the others. Garner defines in a clear, digestible manner the way in which search engines use content and social media data to determine relevancy and user intent when delivering results. There is no better time to expand the reach of this book to the Chinese market, where content and Internet marketing is growing at a rapid pace. “Search and Social” calls to attention the necessity of real-time marketing, where businesses must “redefine themselves in the digital realm through participation and connections through content.” This to say that digital marketing is not a five-days-a-week, 8-hour job, but rather an around the clock assessment and adjustment of SEO, content and social media efforts. More importantly, it is an opportunity for brands to close the gap between “company” and “consumer,” and turn historically one-way communication into a conversation between the two parties. Rob Garner is the Chief Strategy Officer at Advice Interactive Group in McKinney, TX. He is a speaker, educator, and renowned expert on the topic of online marketing, search, social, and content. He speaks regularly at many industry events, including SXSW, ad:tech, Search Marketing Expo, SES, WebmasterWorld/Pubcon, and OMMA.